We’ve finally done it! 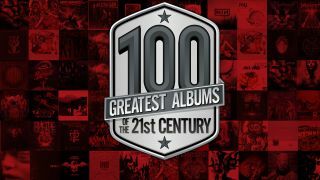 After months of agonising research and bitter arguments between every Hammer staff member, we have put together the one list to rule them all – the 100 greatest albums of the 21st century! The past 16 years has been pretty wild for metal. We’ve had the nu-metal explosion and subsequent meteoric rise of Slipknot, the New Wave Of American Heavy Metal dominate for years, and some of the most extreme and violent music ever created from the likes of Behemoth and Converge. In fact there has been so much great music it’s hard to know what to listen to, which is why we’ve created the ultimate and definitive list. In the new issue of Hammer we count down the 100 greatest albums of the 21st century and talk to the bands that made the music we love. From Hybrid Theory to Mutter, from Come Clarity to God Hates Us All – this is the biggest and best celebration of modern metal. We also revisit some of the landmark albums since the year 2000 and find out what the bands think of them now in brand new and exclusive interviews with some of the biggest names in modern metal. We take you behind the curtain at this year’s Metal Hammer Golden Gods. What happened onstage, what happened backstage, what happened at the afterparty (we don’t really remember) – it’s all in here as we salute metal in 2016. Scott Ian has already starred as a walker in The Walking Dead, so it makes perfect sense that he’d be a white walker in Game Of Thrones! Scott shows us the extreme transformation needed to make him the ultimate evil badass. Winter has come for you all. Will from Black Peaks loves Gojira. Loves Gojira. So much so that he just had to tell us all about it! From the band’s ludicrous musicianship to their environmental work – there’s a lot celebrate about the French metal heroes. We’ve also got FREE Iron Maiden mega-pack that includes four exclusive Eddie beer mats and two massive posters! And we’re giving away a special collectors’ Sinsaenum EP for all you Joey Jordison fans! There’s all this plus Bury Tomorrow, Inquisition, Black Stone Cherry, Necronautical and much more. Read Metal Hammer the way you want. Instantly read the articles from issue 286 of Metal Hammer and dive into the back issues right now on TeamRock+. Get a copy of Metal Hammer 278 delivered to your door.